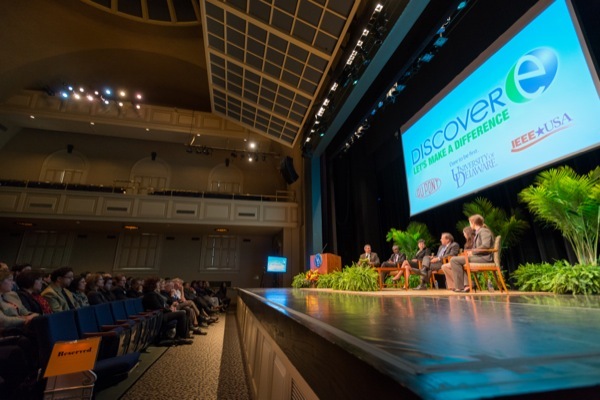 University of Delaware leadership and partners from DuPont, IEEE-USA and DiscoverE held a live webcast on the UD campus Friday, Nov. 15, to discuss the future of engineering and build anticipation for the 2014 National Engineers Week. See Panel Discussions. Participating in the live webcast from UD in advance of the 2014 National Engineers Week were panelists Domenico Grasso, Babatunde Ogunnaike, Karen Fletcher, Gary Blank, Elizabeth Mahoney and Kelsey McWilliams. See Panel Discussions. Pictured are (from left) panel moderator Carol Henderson; Clinita Randolph, UD master's student in biological sciences; Hans Louis-Charles, UD doctoral student in disaster science and management; Asia Dowtin, UD doctoral student in geology; and Erin Kerrison, UD doctoral student in sociology and criminology. See Panel Discussions. 12:41 p.m., Nov. 22, 2013--For the Record provides information about recent professional activities of University of Delaware faculty, staff, students and alumni. Thomas H. Epps, III, the Thomas and Kipp Gutshall Professor of Chemical and Biomolecular Engineering, has been named a 2014 Young Investigator by Sigma Xi, an honor society of research scientists and engineers. Given annually, the honor designates Epps as a member who has ““shown excellence in research in the fields of physical sciences and engineering, including mathematics, or life and social sciences.” Epps will be recognized at the society’s 2014 annual meeting in Glendale, Ariz., where he will deliver an invited lecture. At UD, Epps’ research focuses on designing, building and characterizing of new polymeric materials that exhibit self-assembling abilities on the molecular level. Peter Weil, associate professor of anthropology, received the 2013 Qwerty Award at the annual meeting of the Early Typewriter Collectors Association, Morgantown, W.Va., Oct. 12. The award was presented to Weil, a regular contributor to the association’s quarterly magazine ETCetera through his column “Ephemera,” for “quality of excellence of reporting on typewriters.” The focus of the column is the history of the typewriter from 1874 on, in relation to the development of industrial office cultures in North America and Europe. 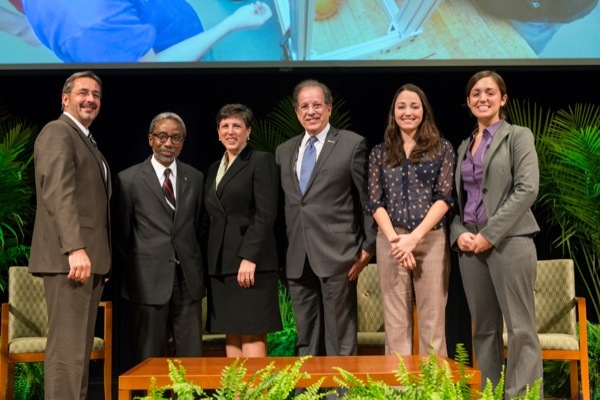 University of Delaware leadership and partners from DuPont, IEEE-USA and DiscoverE held a live webcast on the UD campus Friday, Nov. 15, to discuss the future of engineering and build anticipation for the 2014 National Engineers Week. UD President Patrick Harker opened the webcast, which featured a panel discussion about the role that engineers play in solving society’s grand challenges and the need to diversify the engineering workforce. The panel was led by UD Provost Domenico Grasso, and featured Babatunde Ogunnaike, dean of engineering at UD; Karen Fletcher, vice president and chief engineer at DuPont and a UD alumna; and Gary Blank, president-elect of IEEE-USA; Elizabeth Mahoney, UD chemical and biomolecular engineering doctoral student; and Kelsey McWilliams, UD undergraduate environmental engineering student. National Engineers Week (E-week) was created by DiscoverE to “sustain and grow a dynamic engineering profession through outreach, education, celebration and volunteerism.” E-week 2014 will take place Feb. 16-22. Following the webcast, members of the DiscoverE Steering Committee and Diversity Council toured the new Interdisciplinary Science and Engineering Laboratory. In early October, members of the Black Graduate Student Association attended the Black Doctoral Network Conference in Philadelphia. 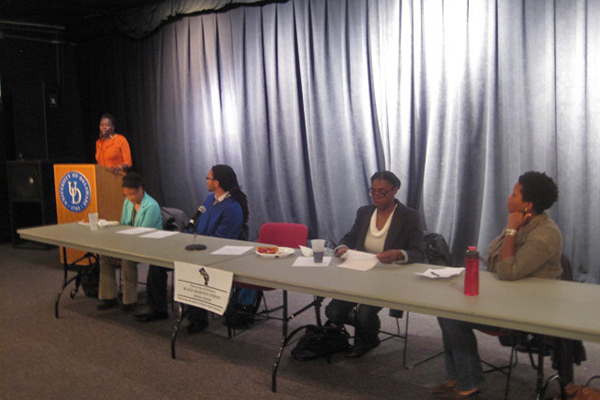 In an effort to continue the discussion of the conference themes of scholarship, service and community on campus, the BGSA with the support of the Black Student Union held a panel and open discussion on Oct. 28. The panel discussion, titled "Sharing Secrets for Success," was moderated by Carol Henderson, professor of English and chair of the Department of Black American Studies. The panel consisted of senior graduate students who attended the conference and shared their graduate school experiences with an audience of current undergrad and graduate students. The topics discussed varied a great deal, including individual motivation for going to graduate school and overcoming feelings of "hitting the wall," as well as the importance of grades. The discussion was a lively interaction between the audience and panelists, who both openly shared their stories of success and failure. The main takeaway of the event, as summarized by Henderson, is to always work toward having a good "mind, body and spirit balance," which is key in being successful in whatever you do. Alice Ba, director of Asian Studies and associate professor of political science and international relations, gave an invited talk on “South China Sea Dilemmas and Conflict Moderation Prospects” at Georgia State University in Atlanta as part of a discussion on “Maritime Territorial Issues and Promoting Peaceful Relations in East Asia.” The event was sponsored by GSU’s Asian Studies Center and the consulate general of the Republic of Korea in conjunction with GSU’s Department of Political Science and College of Law, Nov. 18. Rudi Matthee, John and Dorothy Munroe Distinguished Professor of History, presented “The Decline of Safavid Iran: A Comparative Perspective,” at a seminar “The Spanish Monarchy and Safavid Persia in the Early Modern Period: Politics, War and Religion,” held at the Instituto de Historia, Consejo Superior de Investigaciones Científicas, Madrid, Spain, Nov. 7. He also spoke on “From Splendor to Ruin: Western Travelers to Iran after the Fall of the Safavids,” at a British Institute of Persian Studies conference, “Persia and Rum,” organized at the British School at Rome, Italy, Nov. 14-15. To submit information to be included in For the Record, write to ud-ocm@udel.edu.